The term ACE-Inhibitor stands for angiotensin-converting enzyme inhibitor and these are drugs most commonly prescribed to those with high blood pressure or congestive heart failure (CHD). What are They Exactly and How do They Work? Angiotensin I is a substance we all have naturally in our body. When this is released it is converted into angiotensin II by another substance called Angiotensin Converting Enzyme (ACE). Angiotensin II is necessary when we need our blood vessels to narrow (vasoconstrict) and raise our blood pressure. The substance called ACE is also important in the control of how much blood we have in our vessels. ACE-Inhibitors block the conversion of angiotensin I to angiotensin II. The effect of this is that the blood pressure is reduced meaning the force of the blood through the vessels is decreased. This helps cardiac function by lessening the amount of work the heart has to do as it doesn’t need to beat as strongly as it did when the blood vessels were narrower. In addition, by reducing the amount of blood volume we have also means there is less blood for the heart to process, further decreasing its work. These drugs are used in the treatment of almost all patients with congestive heart failure and frequently for those with high blood pressure that has not decreased by altering lifestyle or using other medications. 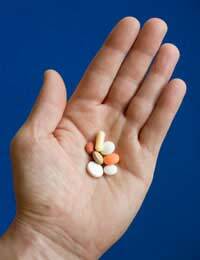 What Other Medications do I Need? High blood pressure can be tackled in many ways and the type of treatment you are offered will depend on the cause of your high blood pressure so it is common for these patients to take different drugs to others with the same condition. In the treatment of congestive heart failure, it is almost certain that you will need a water tablet (diuretic) as well, in order to reduce the excess fluids that can build up in the tissues as a symptom of the illness. As ACE-Inhibitors work by reducing your blood pressure, extra care will have to be taken when moving suddenly, especially when assuming a standing position after sitting or lying down. These actions cause changes in the blood pressure of all of us, but for those on ACE-Inhibitors, the drop can be very sudden and quite severe causing dizziness or feeling faint. Suffering from a dry and annoying cough is a common side-effect of the taking these drugs so ease with lozenges and sipping lots of water throughout the day. Always take your medication as prescribed and do not take more than the prescribed dose even if you have missed an earlier tablet. If you are taking water tablets, try and take these in the morning so your bladder can be emptied during the day instead of during the night which can leave you feeling even more tired and lethargic the next day. Keep a diary of weekly weight as this will indicate whether you water tablets are working correctly determining whether your prescribed dose is sufficient for your needs. ACE-Inhibitors are very powerful drugs and alter the pressure at which your blood is being forced through your blood vessels. By lessening this pressure the workload on the heart is reduced as each beat can be performed with less force.